Bentley has created the ultimate collector’s model inspired by the Arabian Gulf’s rich pearl diving heritage, with a personal commission for a Middle Eastern customer – the Bentayga Mulliner Pearl of the Gulf. Just five of these exquisite W12-powered cars will be handbuilt by Mulliner’s craftspeople in Crewe, England, each featuring unique Mother of Pearl and Arabian Gulf-themed motifs.Each model has a bespoke interior that celebrates the Arabian Gulf’s history of pearl diving, a tradition that dates back millennia and was once the region’s main economic driver. Most notably, intricate marquetry to the Dark Fiddleback Eucalyptus fascia features a pearl diving dhow boat scene, beautifully inlayed with Mother of Pearl. The luxurious cabin is appointed with Linen main hide and complemented by Brunel secondary hide – a colour scheme inspired by the natural beauty of pearls – with a Mother of Pearl Breitling clock the dashboard centrepiece. Camel and Brunel contrast stitching is employed for the quilted seats and door inserts, while gold thread embroidery highlights this Bentayga’s pearl diving credentials. Lambswool rugs are also cut in matching Linen, while Mulliner illuminated treadplates welcome passengers in to the cabin. 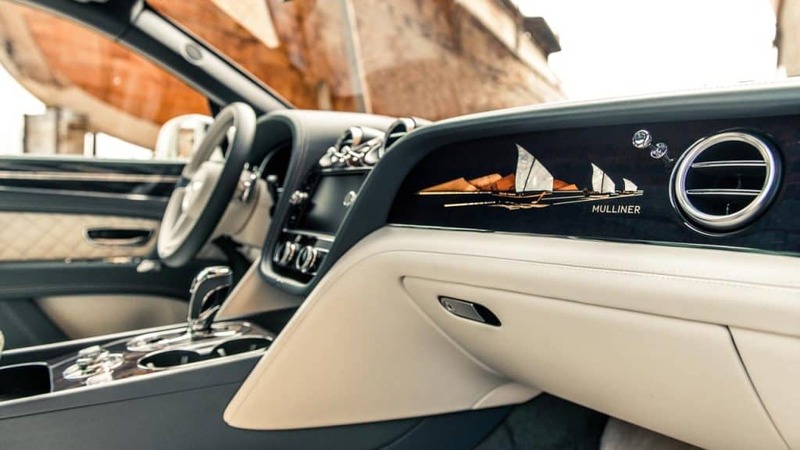 Gulf pearls are among the rarest and most sought-after in the world, so to help keep valuables safe in the Bentayga Mulliner Pearl of the Gulf, Mulliner has installed an ingenious fingerprint secure storage. The fingerprint sensor technology has been applied to a high pressure die-cast aluminium secure stowage unit located in the cabin. This discreet and unobtrusive locker creates the ideal place to stow valuables while at the beach or utilising valet parking services.